I was down in Copley Square last week for the first time since the marathon bombings. The place was still crawling with news trucks and reporters and police on a beautiful Tuesday morning. 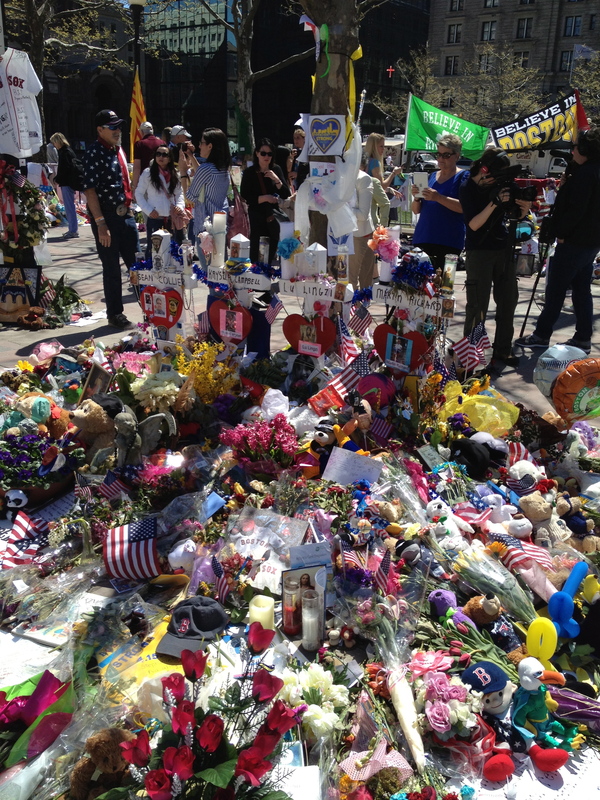 I saw the impromptu memorials made up of running shoes and t-shirts and flowers and teddy bears and hand-made signs. 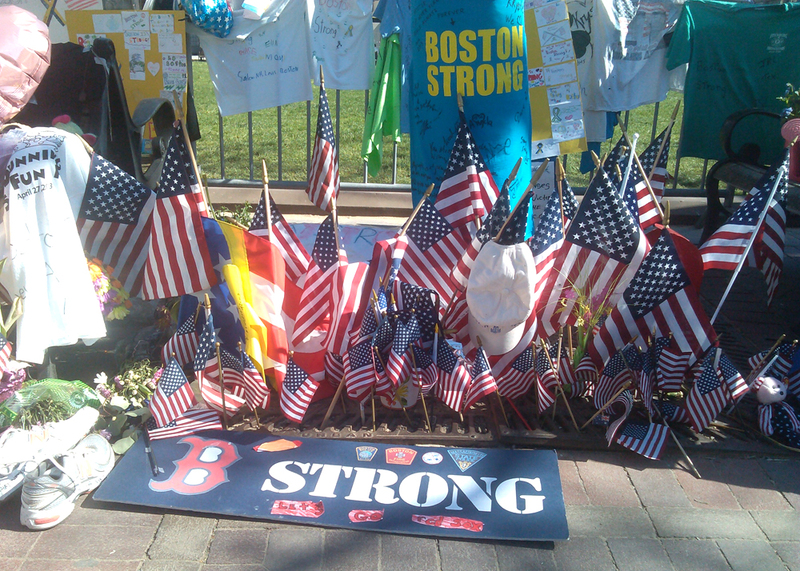 There was a hushed tone quality in the memorial area even as the bustle of downtown Boston swirled all around it. People were writing notes of prayer and support and simply milling around trying to take in the whole scene. Some looked stunned, some resigned, some were quietly wiping away tears; there were gawkers, of course, angling to get in the background of one of CNN’s live shots, but I think everyone was in some way seeking to come to grips with what happened on marathon Monday. 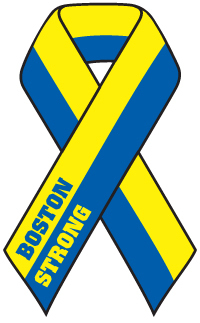 After I said a few quiet prayers, I started thinking about the Boston Strong slogan that’s been on t-shirts and stickers and hats and, more importantly, in the hearts of so many in this area. I agree with the sentiment that in times of trial and distress, it’s important for a community to band together and seek strength in its own unity. Those of us who live in the Boston area take pride in this community and our ties to it and there is great strength of spirit and character here. Anyone who witnessed or participated in the singing of the National Anthem at the Garden before the Bruins played in the first public event after the bombing couldn’t help but get chills. But I think focusing exclusively on the image of strength has potential pitfalls. When we wrap ourselves in the mantra of Boston Strong, we face the possibility of denying our vulnerability both as individuals and as a community. Clinging to the notion of strength in the midst of uncertainty and fear, does make us feel better and safer in the short-term. But it also has a shadow side of desperation — if we only say we’re strong over and over again, it will magically become true. Now I realize no one would buy a hat that said “Boston Vulnerable.” That’s not a slogan anyone would rally around or start chanting at a Red Sox game. But from a faith perspective we’re challenged to think beyond popular slogans to get to the heart of things. People being blown up in a public place on a sacred day at an iconic event makes us feel anything but strong. If we’re honest with ourselves, it taps into our deepest anxieties and fears; and feelings of vulnerability and helplessness can’t help but be stirred up. In his First Letter to the Corinthians, we hear Jesus tell St. Paul, “My power is made perfect in weakness.” In other words strength and vulnerability are not mutually exclusive. It is because of our vulnerability as human beings that we’re able to trust in the strength of God. It’s not our own strength that will see us through — no matter how many t-shirts get sold. It is the strength of God alone that allows us to endure and persevere in the midst of profound tragedy and grief and to find comfort and strength and solace in the context of community. In light of this Paul goes on to say, “Whenever I am weak, then I am strong.” Not because God will fix it and make it all better like a mother who kisses a skinned knee. But because through Jesus we know that God is present even in our darkest hours, even in those moments we feel most vulnerable or alone of forsaken. When I was a priest in New York, a parishioner asked me if I’d go say last rites for his grandmother — the woman who had raised him. The catch was I had to go to some huge hospital in the middle of the Bronx, which I was happy to do even if it meant getting lost a few times on the way. It turned out her roommate had just died and one of the hospital chaplains was with the family as I arrived. He kept saying over and over again, “Be strong. You gotta be strong.” And I wanted to scream, “No! That’s not what they need right now!” This is precisely the time they need to cast their burdens upon the Lord. They don’t have to be strong, just faithful. And if they can’t do that right now they can just be, and let God hold them in the palm of his hand. There’s a time to be strong but there’s also a time to admit our weakness, to admit our powerlessness in a situation and let God take the lead. And in that we find true strength. the connection between faith and strength. Wonderful post, Tim. What would our relationships and communities look like if the rallying cries included the words, “tender” or “compassionate” after the “be”? Agree with all the comments above. This is lovely. Thank you for writing this. Thanks for the thoughtful and helpful words.